An appeal has been issued in an attempt to put an extra spark into Comrie’s Hogmanay celebrations. The famous Flambeaux procession – one of only a handful of fire festivals that still take place – sets off on the stroke of midnight as the bells ring in the new year. 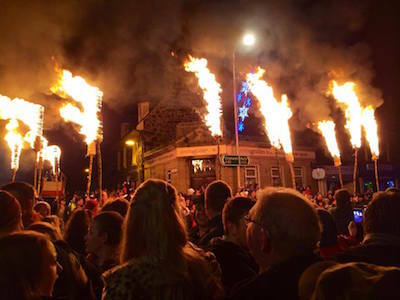 The flaming torches are led to the four corners of the Shaky Village by Comrie Pipe Band and are traditionally followed by revellers in fancy dress. However, in recent years the amount of guisers taking part has dwindled. Hundreds of revellers line the streets to watch, and villagers wait on their doorsteps to call out and wish those passing by a happy new year. This year, organisers would like to see the parade return to its former glory – when people pulled out all the stops to create humorous decorated, self-propelled floats and joined in with fancy dress to create an even more carnival-like atmosphere. “The Flambeaux Parade welcomes in the new year,” said Steven Simpson, secretary of the Comrie Flambeaux Association. He continued: “We are appealing to Comrie residents and visitors alike to come along and participate in fancy dress. “We want to inject some carnival atmosphere and fun back into this ancient tradition. “Earlier in the evening, the junior members of the community have their own fancy dress competition in the White Church and we were encouraged last year by the results of our appeal. “There was a fantastic turn out for the Junior Flambeaux Parade, which is always very well attended. The Junior Flambeaux begins at the White Church at 6.30pm. This will be followed by the annual firework display from Dalginross Bridge immediately afterwards at approximately 7pm. There are also prizes in the adult fancy dress competition for best individual, pairs and groups. Those who wish to take part should congregate in Melville Square at 11.30pm on Hogmanay. NB. The article above was taken from the Strathearn Herald/Daily Record.